The rumored Huawei Mate 20 Pro appears set to boast three rear cameras, as another image leak has hit the web showing what we've previously seen. The "official marketing pictures" have been picked up by WinFuture from a source, and appear to show a rather awkward raised square on the rear of the handset which houses three cameras and a flash. 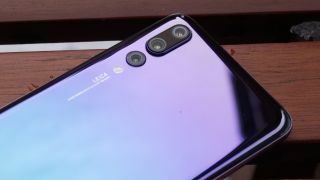 A triple camera setup on the rear of the Mate 20 Pro (and potentially the rumored Mate 20 as well) wouldn't be a surprise, as the Chinese firm offered this on the Huawei P20 Pro earlier in the year - but the arrangement in this latest leak, and previous leaked shots, is raising a few eyebrows. The renders arrive in three color options, with black and blue finishes showing up alongside Huawei's stylish Twilight, two-tone finish. While the odd camera layout draws the eye in these renders, there is a feature which is noticeably absent - a fingerprint scanner. The notch at the top of the display has increased in size over the P20 series though. This could indicate that the Huawei Mate 20 Pro could come with face recognition technology as its main biometric function, but according to the same source it will also feature an in-display fingerprint scanner. We already know that the OnePlus 6T will feature an in-display fingerprint scanner, and Huawei has previously included the technology in the super-premium Porsche Design Mate RS, so it isn't too much of a stretch to see it in the Mate 20 Pro as well. There's not long to wait to find out exactly what the Mate 20 and Mate 20 Pro will offer though, with a launch date set for October 16 in London.